After spending ten years as a school teacher then raising her five children, Anne Emery wrote short stories and books for girls becoming one of our favorite authors of the 1950s, 1960s, and 1970s. Anne Emery was born Anne Eleanor McGuigan, in Fargo, North Dakota, and moved to Evanston, Illinois, when she was nine years old. 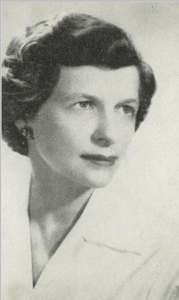 Miss McGuigan attended Evanston Township High School and Northwestern University. Following her graduation from college, her father, a university professor, took the family of five children abroad for a year, where they visited his birthplace in Northern Ireland, as well as the British Isles, France, Switzerland, and Italy. Miss McGuigan spent nine months studying at the University of Grenoble in France. She taught seventh and eighth grades for four years in the Evanston Schools, and fourth and fifth grades for six more years after her marriage to John Emery. She retired from teaching to care for her husband and five children, Mary, Kate, Joan, Robert, and Martha. In addition to managing her household, Ms. Emery took part in numerous community activities. Eventually, Ms. Emery wrote short stories and books for girls becoming one of the most popular authors of teen fiction.